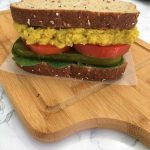 Grab some napkins and dig right in to this creamy, flavourful, absolutely delicious chickpea salad sandwich. So easy to make, using only 10 ingredients, and 5 minutes to make from start to finish! 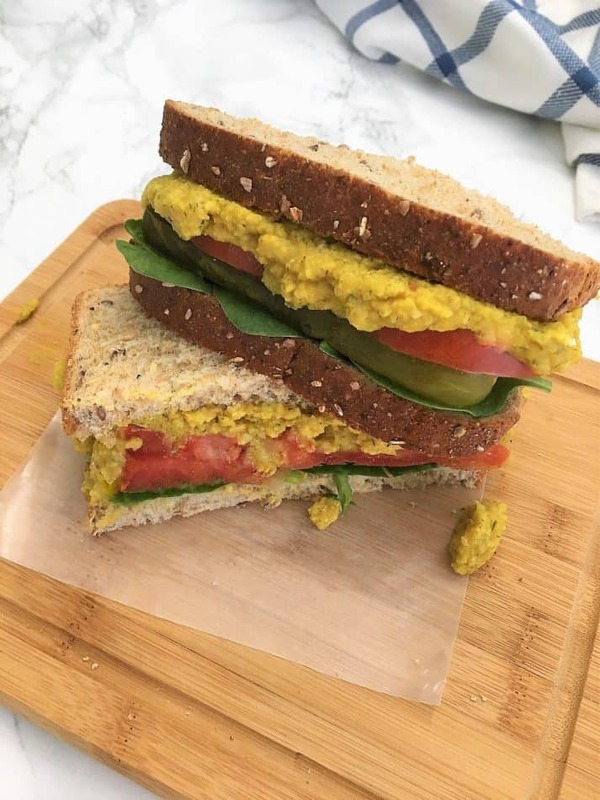 This simple sandwich is packed with flavour and uses only wholesome plant based ingredients. Plus, it’s oil free and gluten free. Simple! Open a can of chickpeas and drain them, but reserve its liquid, otherwise known as aquafaba. Aquafaba is a magical ingredient, really, especially for vegans. It has so many practical functions. It works well as an egg substitute for baked goods, or it can be used to make vegan mayonnaise. I’m using it here to make creamy chickpea salad that somewhat resembles egg salad. For all of you with egg allergies or who simply choose not to eat eggs, this recipe is for you! Next, you will add all your ingredients (except the bread) to a food processor and pulse several times. If you don’t have black salt, you may use whatever salt you typically use. However, I do highly recommend the black salt for this recipe, as it tends to give the chickpea salad sandwich a more “egg salad” sandwich flavour. You want the mixture well combined, but still containing some chunks and texture. So make sure not to over process. When you’ve reached your desired consistency, grab your sliced bread and make a sandwich with any of your favourite sandwich toppings. I went for tomato slices, baby spinach and sliced pickles. The pickles combined with the dill flavour in the salad itself is just YUM! See for yourself! Give this recipe a try, and as usual, I’d love to hear what you think. If you enjoy this recipe, you might also love these! 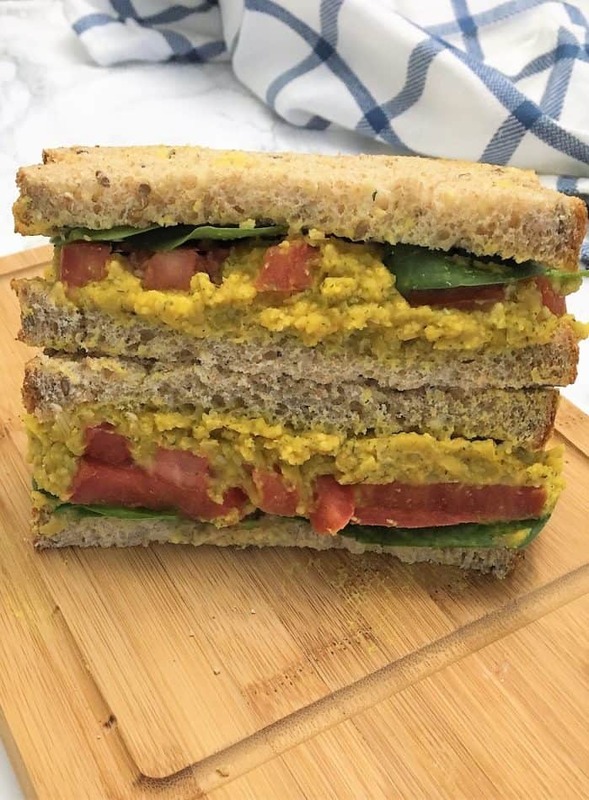 Chickpea salad sandwich ready in 5 minutes flat, and made using wholesome ingredients to mimic your favourite egg salad sandwich. Add all your ingredients to a food processor and pulse until combined, but still chunky. Don't over process, leave a little texture. Serve on your favourite bread with tomato slices, pickles, and baby spinach if desired. Nutritional information includes 2 slices of gluten free toast bread and one third of the chickpea salad. Additional toppings are not included in the calculation. I want this so badly during the weekend grab and go type of lunch in a hurry. It looks super delicious. Thanks for the recipe. Why am I draining the chick peas if the water is just going into the food processor as another ingredient? I love chickpeas so this sandwich is calling my name. Can’t wait to try this for a yummy easy lunch. Thanks Stephanie, hope you enjoy! I LOVE chickpeas in any and every way! Can’t wait to give this sandwich a try! Also, I had no idea that the liquid in the can actually had a name – how interesting! I love chickpeas so am sure I’d like this sandwich. I didn’t know the liquid from canned chickpeas was called aquafaba and is good for you! Have to remember that! 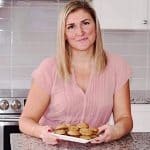 Hi Jacqueline, I only recently learned about this magical and versatile ingredient aquafaba. Hope you enjoy this sandwich! I’ve been trying to incorporate more plant-based meals into my diet, and it’s easiest to do at lunchtime. This is perfect! Sounds delicious! I’m going to see if I can get some more chickpeas into my kids’ bellies this way!! Thanks Diana, hope your kids enjoy! I’ve been eating egg salad everyday for lunch for weeks now. This might be a nice change to the routine. Looks delicious. Thanks so much Emily. Hope you enjoy!